A playground in the civic center, located between the community center and the city hall. "You have the incorrect phone number for this facility. The number you have is our ffice phone. We are located in the Santa Cruz Mountains" - Boulder Creek Recreation & Park District. 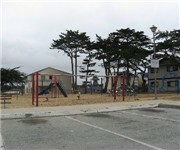 How Would You Rate Marina Civic Center Playground? A large playground in Jade Park in Capitola, CA.